So I’m pretty much in love with my new sneakers. And when I say pretty much I mean totally. They are the Nike Roshe Run Palm Trees and they are perfect for these days when I’m going to be running around the place. 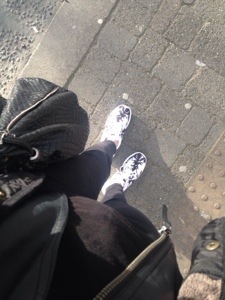 I kept my outfit nice and simple, lots of black as usual. I have my most battered, but one of my most loved bags with me today. I got it in Urban Outfitters about 4 years ago and it has been dragged along everywhere with me, normally stuffed full with half my wardrobe. 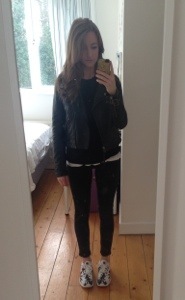 Other details include my Topshop leather jacket, my reflective shades and my DVF headphones. Hi there, I got them in Office in Dublin. They were released last summer and sold out online in a day. Maybe try EBay? Sorry I can’t help more!